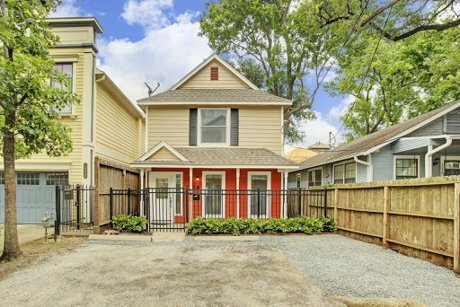 1526 Dorothy Street | SOLD in the Houston Heights! 1526 Dorothy Street is a Victorian style home located in the Houston Heights area. This extraordinary home has been extensively remodeled, with fresh paint and new hardwood floors throughout the house, brand new appliances, new fittings, and exquisite finishes and fittings. Exceptional floor plan with generous room sizes, an open living and dining area, a first floor master bedroom suite and more! Fantastically remodeled home. Fresh paint and hardwoods throughout the home and beautiful finishes. Colonial style porch located behind a private gate is accented with a leaded glass front door. Plenty of front parking! Open-concept living and dining area. Powder room with granite counters located near the living area. Great natural lighting! Kitchen has been remodeled with white shaker cabinets, granite counters, energy efficient stainless steel appliances, and a breakfast bar. First floor master bedroom suite has a large walk-in closet and a full en-suite bath. Private entrance to the backyard, as well as room for a sitting area. Master bath has a frameless walk-in shower, granite counters, a porcelain sink, tile floors, and great storage. Second floor features a well-designed study, with granite counters, hardwood floors, and plenty of built-ins. Great as a home office or a kid's study area! First upstairs bedroom features large closets and windows. Full upstairs hall bath with granite counters and plenty of storage cabinets. Second upstairs bedroom has a walk-in closet and a door leading to the private second story patio. Patio has a tile floor, a trellis, and a spectacular view of the backyard. Large, fully fenced-backyard has great space for a social or play area. Storage closet to keep gardening tools and equipment. Zoned to Love Elementary School, Hamilton Middle School, and Heights High School. Please check availability.